Dynamic load plate test – No heavy carrying! 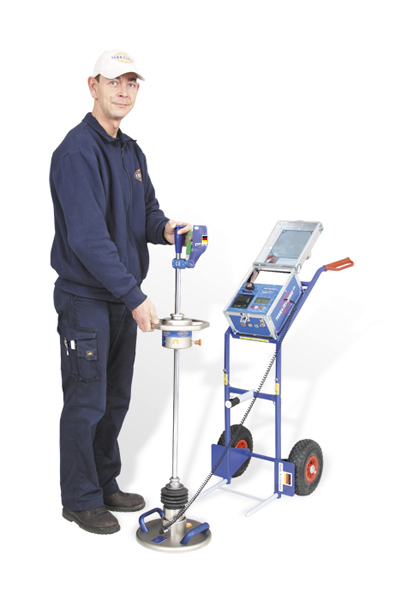 Mobile Light Weight Deflectometer “CARRELLO” for the dynamic plate load test was designed for comfortable testing all over your construction site. “CARRELLO” enables easy handling of your TERRATEST Light Weight Deflectometer without carrying the 35 kg device. The complete Light Weight Deflectometer is hooked up under the angled handles of the load plate and hauled across the construction site. The dynamic load plate test can be done quickly and precisely by a single person in less than two minutes. It does not need any counterweight unlike the static load plate test which requires at least 30 minutes of time and can only be carried out using a counterweight like a truck, excavator or a steamroller – which is why it is extremely difficult to execute the static load plate test in areas that are hard to access like utility trenches for example. Due to its complicated procedure and the complicated calculation method of the test result, the static load plate test is usually only being performed by testing laboratories. This often causes a certain waiting time during which the construction company has to stop the construction works until the testing laboratory is presenting the test results. Thanks to “CARRELLO” the handling of the Light Weight Deflectometer for Dynamic Plate Load Tests will become easy and comfortable, even across long distances! The dynamic load plate test with the dynamic load plate – also called dynamic plate bearing test – is a compaction test for rapid determination of the bearing capacity of grounds. The determined dynamic deflection module Evd (according to the Technical Test Code for Soil and Rock Mechanics in Road Constructions – TP BF-StB Part B 8.3) is measured in MN/m². It is being used in road and pipe construction as well as in earthworks, in order to judge the compaction quality of mounted layers, even while still in the construction phase. 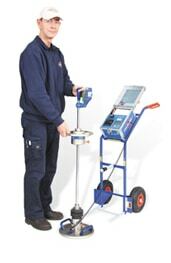 Thanks to the dynamic load plate test the executing company is able to assess the correct compaction of the ground layer by layer with their own staff. If the different layers are only being checked at the end of the earthworks, for example by using dynamic probing, extensive costs for dismounting, re-compacting and re-assembling the ground must be expected in case of poor compaction quality of the lower layers. 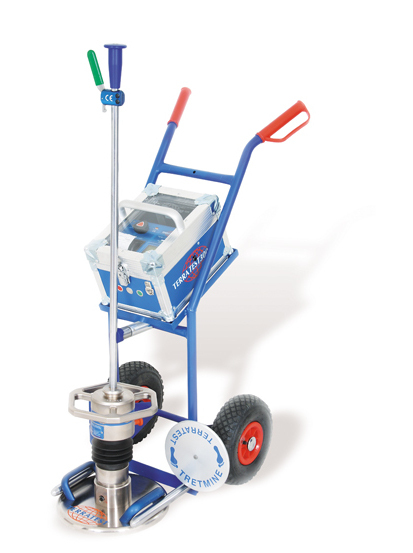 The dynamic load plate test with the dynamic load plate however is especially suitable for compaction tests in areas that are difficult to access like utility trenches, shafts and backfills. Furthermore, tests with the dynamic load plate can be performed throughout the compaction works, allowing for these to be conducted precisely and effectively. A further advantage is that with the aid of the dynamic load plate test the entire area, not just parts, of the construction field can be checked for a homogeneous compaction quality in a minimum of time. The results of the dynamic load plate test can be evaluated and printed directly on site. Thanks to the easy, intuitive operability of TERRATEST’s Light Weight Deflectometers even non-experts can perform the dynamic load plate test after a short introduction.